She’s the Coldest is reminiscent of Lil’ Flip’s Game Over. Infusing the effort with a bit of the punchline rap style of Lloyd Banks and Canibus. Return of the Beast succeeds because the tracks all have a different feel to them, all while contributing to an overall sound that permeates Return of the Beast On Tha Mic, Pt. 1 just as it does during Where You Going. 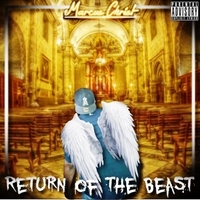 Where many artists place their weaker efforts on the second halves of their albums, Marcus Christ is able to keep the disc strong throughout. Nowhere is this better heard than during I Knew This Girl. There is a more evolved sort of use of spacing and pausing, imbuing each bar spat during the track with a certain gravity requiring fans to focus in. I Aint Gotta Show You keeps things dark and dangerous, inserting a bit of reality into an already dead-serious release. As each line is spit by Marcus Christ, listeners will know that he is speaking the truth. The bit of pop hook that is presented in this track will have fans clamoring for the single on the request line. Keep an eye out on Marcus Christ’s Soundcloud for new songs and Facebook for additional information about this unique and interesting rapper.